In 2017 the COMPASS trial, published in the New England Journal of Medicine tested the effectiveness of rivaroxaban (alone or in combination with aspirin) at preventing secondary cardiovascular events in patients with stable atherosclerotic vascular disease, compared to aspirin alone. In this study, patients receiving rivaroxaban in combination with aspirin had better CV outcomes, but more major bleeding events. An update from COMPASS, presented at the ESC2018, tested the hypothesis that in patients with vascular disease receiving antithrombotic treatment, major bleeding events – specifically gastrointestinal (GI) and genitourinary (GI) – are associated with increased rates of GU and GI cancer diagnosis. Researchers recommend that GI and GU bleeding in patients on antithrombotic therapy should prompt investigation for cancer; furthermore, extended follow-up of the COMPASS trial participants should be undertaken to determine whether the earlier cancer diagnoses due to antithrombotic therapy improve cancer outcomes. 1. Eikelboom JW, Connolly SJ, Bosch J, et al. Rivaroxaban with or without aspirin in stable cardiovascular disease. NEJM 2017; 377 (14): 1319-1330. For decades bleeding has been recognised as one of the first possible manifestations of cancer. 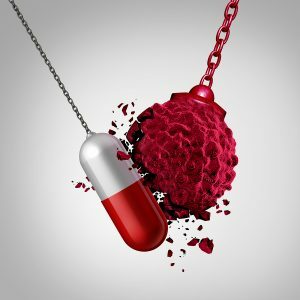 Therefore it is unsurprising that treatment with anticoagulants in any trial might unmask occult cancer because these drugs alter the coagulation process and therefore facilitate bleeding in any territory. Obviously, anticoagulants should only be used when a benefit is expected – that is when thromboembolic risk is higher than the theoretical bleeding risk, even with the drug. However, anticoagulants may lead to an unexpected benefit if they help to diagnose cancer at an earlier stage than would spontaneously occur, which has clear prognostic benefits. Interestingly, cancer promotes venous thromboembolism which might be even fatal. Therefore anticoagulants may protect against thrombosis and simultaneously unmask the cancer process at early stages. Recently, using the data from the COMPASS trial, which randomized 27,395 patients with stable coronary artery disease or peripheral artery disease to receive rivaroxaban 2.5 mg twice daily plus aspirin, rivaroxaban 5 mg twice daily, or aspirin 100 mg once daily, it has been shown that in patients with vascular disease treated with anticoagulants, gastrointestinal (GI) and genitourinary (GU) bleeding are associated with increased rates of new GI and GU cancer diagnosis. Increased GI bleeding with rivaroxaban appears to unmask cancer at an earlier time point. Extended follow-up of these patients will clarify if early cancer unmasking by bleeding improves cancer outcome.